Australia is full of bizarre creatures. Massive snakes, flying foxes, sharks, paralysis ticks, spiders -- you name it, Australia’s probably got a lot of it. The country’s weirdest creature, however, may have just washed ashore at Coorong National Park in South Australia. Steven Jones, the supervisor of a cockle fishing crew, along with crew member Hunter Church discovered an enormous sunfish (Mola mola) at the mouth of the Murray River, according to CNN. The fish was so big, in fact, that Jones’ partner, Linette Grzelak, said Jones “thought it was a piece of driftwood.” Upon further inspection, they realized it was actually an animal, and posed for a photo with it. Grzelak shared it on Facebook, and the photo started gaining media attention. Probably because of how truly bizarre this fish looks. 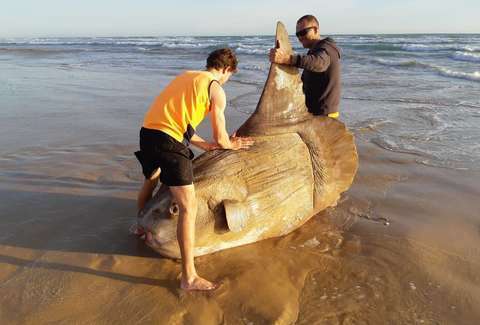 Per National Parks South Australia, sunfish are the world’s largest bony fish. They’re so large, in fact, that some can weigh as much as a car. The National Parks South Australia said the fish feeds mostly on jellyfish and can grow to be over two meters (more than six feet). Grzelak told CNN Jones described the fish’s skin as “leathery like a rhinoceros.” This particular sunfish was “only” 1.8 meters long, which is small according to the South Australian Museum. Little else is known about the Mola mola, as they were only discovered recently. “The Mola mola is known for its large size, odd flattened body shape and fins,” Ralph Foster, the museum’s collection manager, told CNN. Foster added that the fish Jones discovered was identifiable by the markings on its tail and the shape of its head. He added that the sun fish’s name comes from the fact that it enjoys basking in the sun. The Mola mola’s affinity for soaking up the sun’s rays means they can be hit by boats -- but it appears it’s not so much the fish you should be worried about. Foster told CNN some sunfish are so large they wind up sinking yachts when they’re hit by them. Foster said that the Mola mola “was thought to be a purely Southern Hemisphere species,” but it turns out that’s not the case. One such fish recently washed up on a beach in California and was identified after a photo was shared on the Coal Oil Point Facebook page. Experts from around the world weighed in, and were able to peg the strange species. So little is known about these massive creatures. But at least one thing is pretty clear: they’re delightfully strange even by Australia’s standards.